vigorotaku: DC Wedding Photographer : Who does a photographer hire to shoot their wedding? DC Wedding Photographer : Who does a photographer hire to shoot their wedding? Who does a photographer get to shoot their wedding? Well, I am a photographer, I can always shoot it. Right? Not for my own wedding. Actually I could set up remote cameras, a photobooth, and I could do it all myself without all of the additional cost. Yeah - try and get that one by your bride-to-be. While my wife may be supportive of my photography, she would not be happy if I showed up at the family gatherings, or went on vacation with all of my gear for work. Could you imagine if I wanted to do that at my own wedding? So what did I do? Yeah right. I figured that I could find someone who met the first two criteria, but not the last two. Weddings are big business, and Wedding Photography is no exception. As luck would have it, a friend of mine told me about Sandi Foraci Photography. My wife and I took a look at the Sandi Foraci Photography website and we were pleasantly surprised. Both the posed and the documentary photos were excellent. We contacted Sandi and she told us that she was not free the weekend of our wedding, but Marilynn was. We met with Marilynn and we both immediately liked her. We liked her style of shooting and she had a great personality. 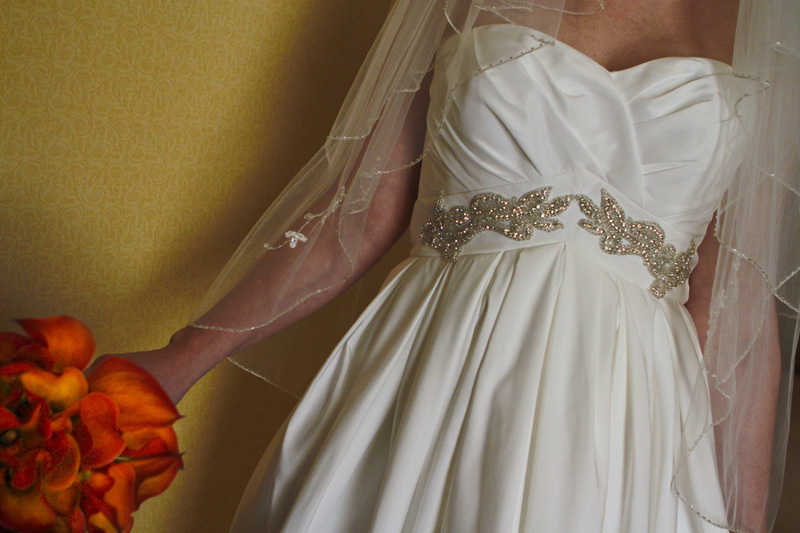 She covered so many different details and aspects of the wedding that we had not even begun to imagine. It was great to have someone that could just lay things out for us in such a way that we didn't feel overwhelmed. We has already picked the venue and the flowers and they were all about options (and costs) with no advice. Our meeting with Marilynn was about us, who we were, and what our wedding would be about. She showed us a few examples of the wedding albums produced by Sandi Foraci Photography. They were all spectacular. We met one more time before the to finalize the details and the exact time schedule for the wedding day. On the day of our wedding, Marilynn met us at our hotel. We got preparation shots and first sight shots prior to boarding a shuttle bus from Chariots for Hire. Marilynn had handled all of the necessary permits for us to get some shots around the National Mall for a few hours prior to the wedding. Marilynn had some great spots scouted out so that the lighting was perfect for the time we would be there. From downtown, we headed to the wedding. The wedding was at 2941, a restaurant in Falls Church. Marilynn covered the entire event like a it was a journalistic assignment. Every moment was captured as it happened. We barely noticed her, but she got every moment, many of which we had missed. She was everywhere, but never seen. It was great! When we saw the pictures, we were so happy with choosing Marilynn from Sandi Foraci Photography. The pictures were wonderful. Careful details and great candids. The color and detail were excellent. I was amazed at how well she had handled the low light of the outdoor wedding and the restaurant. I recommend checking out the featured event photos on their site to see some examples of their for yourself. This is not photography, but if you are looking for a wedding or event florist, you can't beat Tip Top Floral. Tippy runs the business out of her house, but you can tell by what she can get, that she knows her stuff. Also, her prices and service are infinitely better than anyone else in the DC area. Again - I hate to advertise, but I also hate to watch other people waste their money when I can help them out. I would also recommend 2941, in Falls Church. The food was spectacular! It was the best wine and food that any of our guests had ever had at a wedding. We are ourselves are into good food and so were many of our guests, one of which has been a chef in DC for some time now.